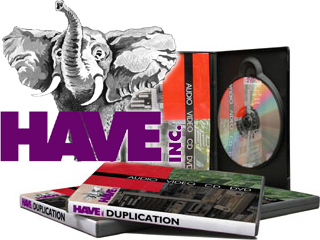 DVD, CD, Video, & Audio Copying - Duplication & Replication Multimedia Services - HAVE, Inc.
At HAVE, Inc., we put great emphasis upon the quality of your finished DVD or CD products. Whether your needs are commercial, corporate or personal, our experienced technicians supervise every job to assure the highest quality masters and dubs. Duplication vs. Replication — what's the difference? In short — quantity needed determines the difference. There is very little difference in quality between a finished replicated disc and a finished duplicated disc. The differences lie in how replicated and duplicated discs are produced, or manufactured. With Replication, a "glass master" is produced from your master source, from which a "stamper" is made that presses the information onto molded discs. Duplication digitally transfers the information from your master source to blank DVD-R or CD-R media. This is what is meant when you hear that Replicated discs are pressed, and Duplicated discs are burned. The cost effectiveness of Replication comes into play generally for manufacturing larger quantities, typically over 1000 pieces. Duplication is generally the choice when producing smaller quantities of DVD's or CD's.